Set of 4 Handcrafted Elephant Ornaments, "Elephants in Green"
Designed by Rajesh Gehlot, these handcrafted ornaments bring a touch of India to the holidays. The cheerful gray elephants are crafted by hand and dressed in green hats and blankets with embroidery. The set of four arrives in a drawstring pouch. 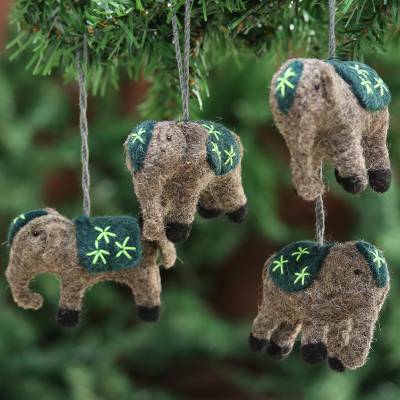 You can find wool ornaments 'Elephants in Green' (set of 4) by Rajesh Gehlot in holiday decor & ornaments categories such as Christmas Ornaments and Animal Themed Ornaments. Enjoy exploring these sections for other Novica treasures.